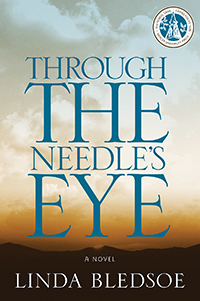 THROUGH THE NEEDLE'S EYE is told through the authentic voice of Jessie, a precocious girl raised in the Blue Ridge Foothills of Southern Appalachia after World War II. Saddled with an alcoholic narcissistic father and a passive mother, Jessie is charged with mothering her siblings as generational curses and poverty never cease to overwhelm her family. As providence would have it, Granny Isabelle, a toothless, wizened humpback spitfire who spouts scriptural admonitions like spears, sets her eagle eye upon Jessie, the child neither parents nor teachers think worthwhile. Sporting a ridiculous paper bag hat, Granny Isabelle chucks clods of dirt with a garden hoe as she earnestly works every stitch of ground to produce beds of corn and green onions to be hawked at nearby markets for nickels and dimes. Through keen intuition and a special bond, she provides a haven for Jessie’s survival to help motivate the child beyond her circumstances. Smokey, a flea infested hound offers Jessie companionship, while kind Uncle Rudy commissions her to dance and laugh with abandon. At the end of the day, Jessie and her grandmother stand together, both yearning to find that missing puzzle piece of life, hopeful that one day this undesirable child might choose to travel amongst the heavenly host, past some glittering stars, to proceed right through the needle’s eye.